What Goes with Cherry Cabinets? 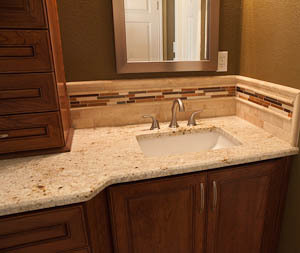 In this case, a Colonial Gold granite countertop goes beautifully in this master bathroom remodel in South Austin. 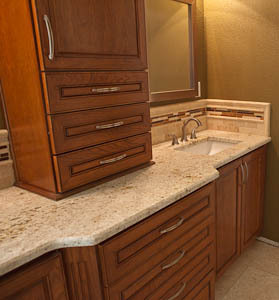 These cherry cabinets were custom made to update this lovely home in the Circle C neighborhood of South Austin. 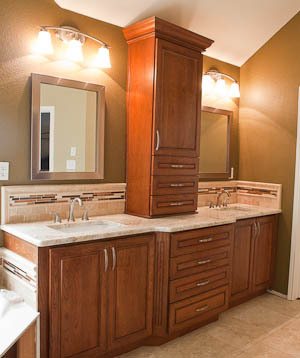 The rectangular undermount sinks are a model we sell called the “trench”. These sinks give a very current style to a bathroom in an older home, or in one like this one that is only about 15 years old. The granite edge profile is a half-inch bevel. We’re making a bunch of pieces to trim out the shower to match the counters. The effect is just marvelous when the granite, the tile and the woodwork is as well coordinated as in this master bathroom remodel. I don’t know what to call the detail in the middle of the granite countertop where the cabinet is bumped out. We’ve seen this in higher-end design magazines for years. 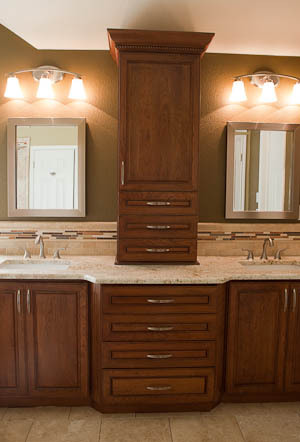 Now we’re starting to see this style in more and more of the nicer bathrooms we’ve been fabricating and installing, particularly in Circle C, Steiner Ranch and Lakeway. The bump out in the granite counter accomodates a deeper set of drawers and helps define the two sides of the countertop. Like that dividing line we all wanted in the back seat of the car when we were growing up. My side!! I’ve been collecting photos of interesting bathroom countertops on Pinterest. If you’re not on Pinterest, you MUST MUST MUST go take a look. Most of those photos are pulled from all over the internet. If you see a style you like, chances are we can make something that looks almost exactly like it, particularly if we can figure out what kind of granite, marble or quartz was used.